I think I’ve mentioned before that mollusks, clams and the like, are some of my absolute favorite foods. Having already conquered clams and linguine I wanted to give mussels a try. Mussels pair so well with a variety of flavors but honestly, why complicate things? 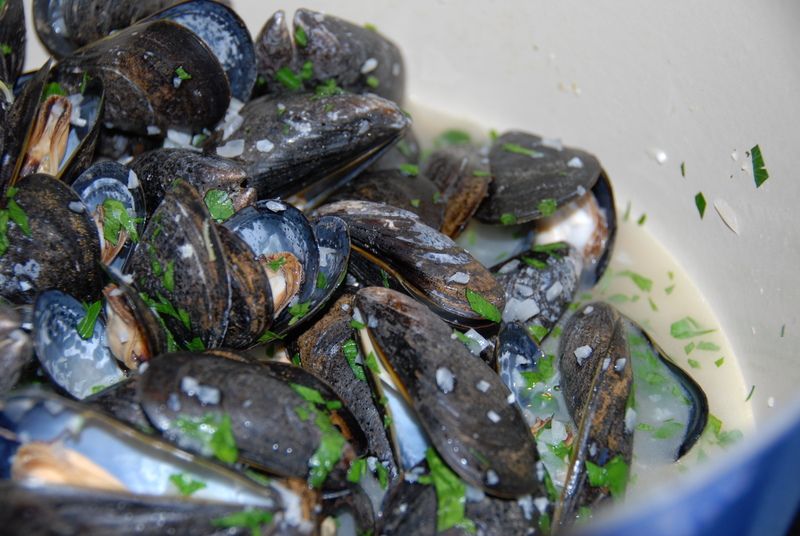 With just a few ingredients, this dish is incredibly flavorful and what’s even better, with the exception of the mussels, everything you need you most likely already have in the house – fresh herbs, white wine, a little butter, salt and garlic. Now, just a note: I used a ton of garlic, and I suggest you do too, because a. it’s totally delicious and b. if everyone has garlic breath no one can complain about yours! 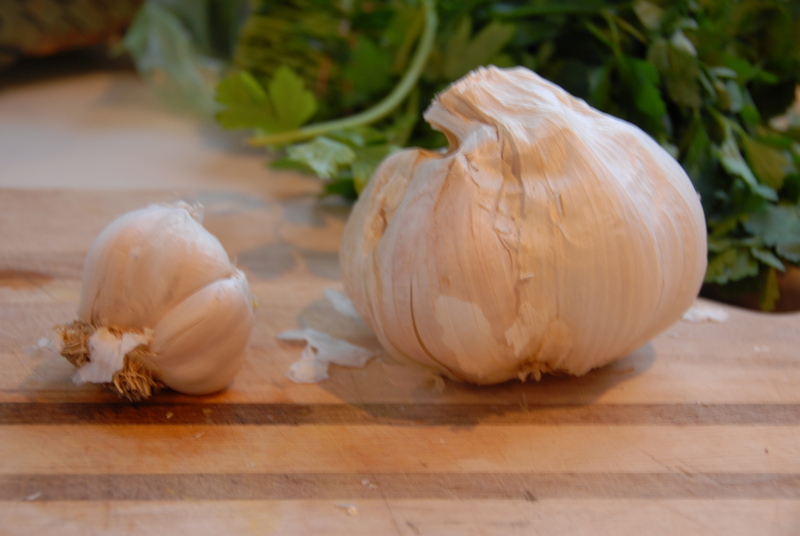 6 cloves of garlic, finely chopped – I also included one very large elephant garlic clove for fun, note: average head of garlic on the left for scale. 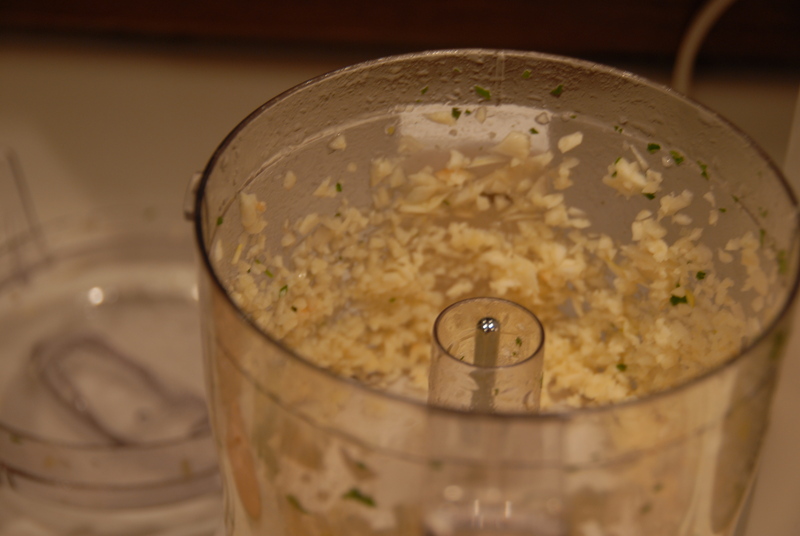 Also note: when using this much garlic I opt for using a mini food processor for easy chopping and to avoid carpal tunnel syndrome. 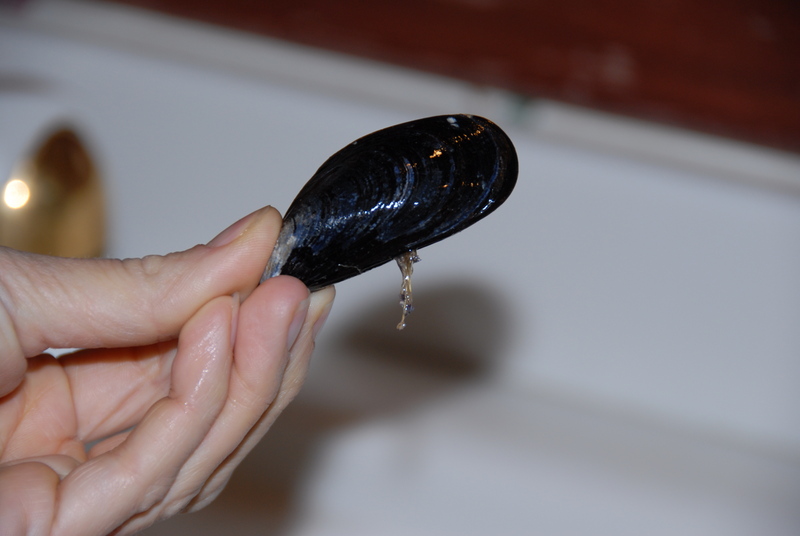 First scrub the mussels under running water and remove the beards. See photo – the beards are the strings hanging from their shell. Discard any dead mussels (those that don’t stay closed after being pushed together a few times). In a large stockpot combine the wine, garlic, shallots and salt. Let it come to a simmer on medium heat. Add the mussels. Cover, and increase heat to high. Cook until all the mussels open – about 5 minutes. Open pot to steamy, garlicky goodness. Place the tabs of butter around, toss a bit to combine, sprinkle the fresh herbs over and immediately dig in. And what better vehicle to sop up all that delicious broth with than some homemade garlic bread? Grab a loaf of your favorite crusty bread, I used ciabatta and it was perfection, a handful of garlic cloves, flat-leaf parsley, olive oil, butter and foil. Heat a cup of olive oil and a few whole cloves of garlic in a small saucepan over medium heat until just fragrant. Pour the garlic infused oil along with a couple tbsp of butter, ½ cup roughly chopped flat-leaf parsley, and a few more cloves of garlic into the food processor. Pulse until it becomes an easily spreadable mixture. Cut the loaf of bread lengthwise in half. Spread the mixture evenly over both sides, place them back together and wrap the loaf in foil. 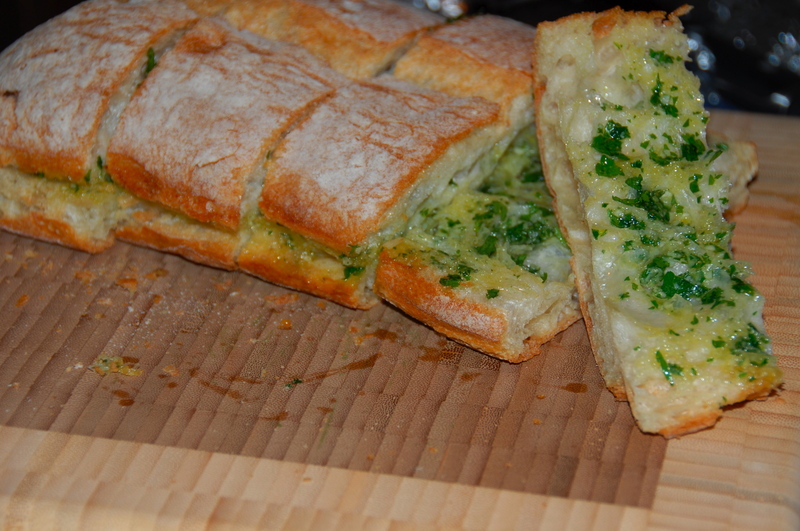 Heat the loaf in a 350° oven for about 10 minutes or so and you’ll have the most wonderfully decadent garlic bread. This is a great meal to have in your back pocket – it’s quick and easy, completely affordable, absolutely delicious and is perfect for an intimate dinner for 2 or a party of 12. Just be sure to have some industrial strength listerine on retainer. This entry was posted in Garlic and tagged easy, garlic, garlic bread, mussels, parsley, quick, white wine. Bookmark the permalink. Its 6:15 am and I want this.